The area in between the breasts is sensitive as it is where the breastbone lies. It consists of connective tissues and skin. It is the meeting point between the collarbone and ribs. Image 1: A pain in between the breasts can be caused by a lot of different things. A sharp pain between breasts can be caused by a lot of things. If the pain is superficial, then it could be linked with some sort of a skin condition or inflammation on the underlying tissues. A sharp deep pain can be serious in nature considering the organs and other structures in between the breasts and the surrounding areas. 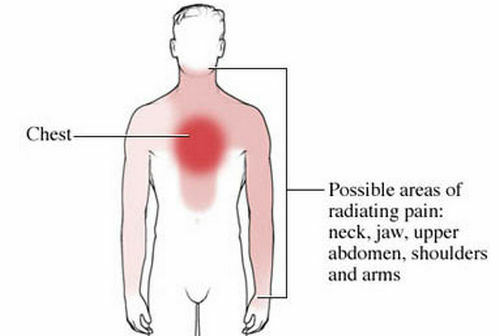 What causes pain in the middle of your chest? The pain between breasts can be caused by a lot of things. We are going to sort the causes based on the origin. Picture 2: A sunburn is one of the causes of superficial pain between the breasts. Sunburn. If you are wearing revealing clothing and the sun is shining bright, there is a tendency of sunburn. The skin in the chest area swells and inflames. There are obvious redness and tenderness, which can cause pain. A fracture of the sternum is one of the underlying causes of pain between the breasts. If the pain is more than just skin deep, then the possible problems lie in the inside structure. It has something to do with the bones, joints, cartilage, muscles, tendons, and ligaments. The breastbone has three parts: the manubrium, sternum, and xiphoid process. Other bony structures include either side of the collarbone (clavicle), ribs, and costal cartilage. Fracture of the sternum (breastbone) – A sudden blow to the chest can fracture the sternum leading to pain between breasts and the surrounding areas. Costochondritis – It is a condition in which the costal cartilages are inflamed causing pain in the chest area, specifically in between the breasts. Arthritis – A joint inflammation can affect the areas in between the breasts as there are numerous joints in that area. Strain – An overexerted muscle can lead to a strain leading to inflammation and pain. If you overexert your muscles such as in the case of training or consistently lifting heavy objects, then you can feel pain between the breasts. Tendonitis – It is the inflammation of the tendon secondary to overstretching and muscle strain. Sprain – An injured or inflamed ligament in the breast area can cause pain between the breasts. If you overstretched or overexerted, then there could be a possibility of a sprain. Image 4: Pain in between the breasts can be a sign of an underlying heart condition. 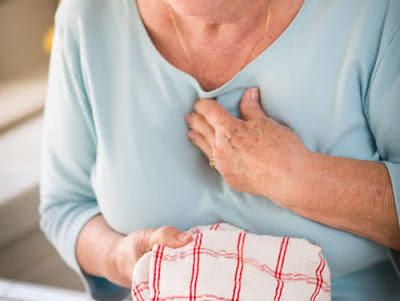 Angina pectoris – The heart muscles are not receiving sufficient blood supply secondary to coronary artery disease. The patient feels a sharp pain in between the breasts and in other areas of the chest as well. If left untreated could lead to a heart attack. Pericarditis – It is the inflammation of the pericardium (lining around the heart) secondary to infection and/or trauma to the chest wall. Myocardial infarction – A part of the heart muscle dies secondary to insufficient blood flow. Signs of myocardial infarction include chest pain, left arm pain, dizziness, and excessive sweating. Aortic aneurysm – A part of the aortic wall bulges leading to aortic dissection. Eventually, it could lead to rupture causing severe pain and inflammation behind the breastbone. Bronchitis and tracheitis – The bronchi and the trachea are inflamed secondary to infection. They cause the bronchi to constrict which impedes the flow of air. Pneumonia – The lungs are inflamed secondary to infection. The lungs are adjacent to the chest which explains why pain and inflammation can somehow be felt in the chest area. Pleuritis – The lining of the lungs is inflamed secondary to infections. The patient experience pain between the breasts which is exacerbated with breathing. Gastroesophageal reflux disease (GERD) – The stomach acid increases and enters the esophagus causing irritation. Clinical manifestations include burning chest pain and nausea. You have had direct blow or trauma to the chest leading to extreme pain. The pain between breasts is accompanied by symptoms of heart attack such as chest tightness and difficulty breathing. Pain between the breasts is persistent and does not improve with time. Pain is intense that it hinders you from performing activities of daily living.